Jaclyn is an occupational therapist practicing general outpatient pediatrics. 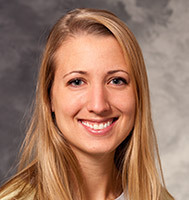 She is also a part of an interdisciplinary team at the Brachial Plexus Clinic, treating infants, children, and teens with acquired brachial plexus injuries. She sees patients upon physician referral. Jaclyn received a Bachelor of Science degree in human development and family studies, with a focus on child development, as well as a Master of Science degree in occupational therapy, both from the University of Wisconsin-Madison.